There is a fast-growing expat community of retirees living on Koh Samui. They have come to escape the cold weather and high taxes on the high priced items in their own country. The nationalities are diverse here allowing the ability to make friends with people from all over the world and share in each other’s experiences. 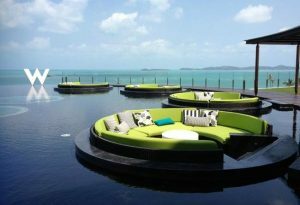 Thailand is one of the most welcoming countries in the world and Koh Samui has developed and adapted over recent years to offer all the comforts of home with the benefits of jaw dropping surroundings. Living on Samui as an expat is easy. The island now features some excellent locations for shopping, including large Western supermarket chains and sometimes you may even forget you are living within a Thai environment. 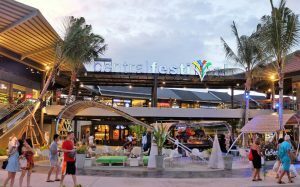 What’s more, Koh Samui continues to develop with new shopping and entertainment centers cropping up all the time. 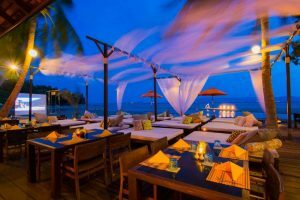 One of the many benefits of living in a resort locale is the wide and abundant dining choices in all price ranges. Thai food, is filled with magnificent flavors but when you’ve had your fill of curry’s then you can enjoy the rest of the foods from around the world. Brazilian, French, Italian, German, Mexican to name just a few. 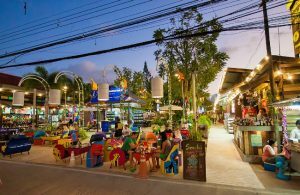 Another benefit of living in a resort area is the wide variety of bars and pubs with Irish Bars, Sports Bars, Beer Bars, Beach Bars etc..
Chaweng is Samui’s most popular resort area and not only boasts the longest beach, but also the biggest shopping and entertainment zone on the island. 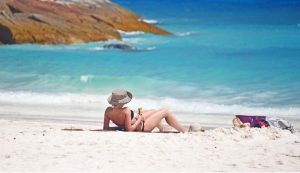 In many ways it is just like any other major tourist hot spot, with hundreds of hotels, restaurants and bars scattered along and behind its fine white sand. Despite a serious upgrade that has created a more family-oriented feel, Chaweng still remains party central and has the highest density and widest selection of clubs, bars and restaurants on the island. 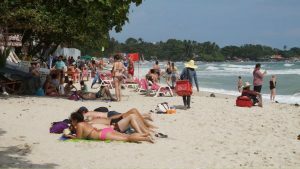 Lamai Beach is the second most popular beach on Samui. It doesn’t have crowds that Chaweng does even though its only half the size. Lamai sits in a sweeping bay with the sands stretching almost as far as the distant Hinta-Hinyai (Grandmother and Grandfather rock formations), which are located behind a small headland. Just to the north of Lamai there’s Tong Takian Bay, with a high, rocky headland and plenty of lush jungle sweeping up into the mountains. Lamai town, set back 100m from the beach itself, stretches along the beach road and by day can resemble a sleepy village. However, it does have a good variety of shops and services, so just about everything can be found here – supermarkets, banks, travel agencies. It’s a far more pleasant area of development than Chaweng, which is about 15 minutes away by bike to the north via a hilly road. Lamai town is also known for their wellness spa’s. As with the rest of Thailand, Koh Samui benefits from a low cost of living, great health care a warm tropical climate and friendly citizens.